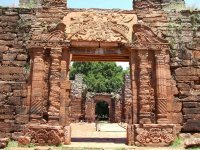 Posadas is the capital of the Misiones Province in the north of Argentina, located along the Parana river with Encarnacion, Paraguay on the other side of the river. The city has approximately 275,000 inhabitants. Libertador General José de San Martín Airport (PSS) is located about 7 kilometres from the city. There are flights to Puerto Iguazu and Resistencia with Aerochaco and to Buenos Aires and Corrientes with Aerolinas Argentinas. The San Roque González de Santa Cruz Bridge connects Posadas with Encarnacion in Paraguay. Route 12 goes to Buenos Aires, about 1,300 kilometres away. Internet cafes are still widely available in most places, even in smaller towns, though many people are connected through the internet at home or by mobile device. Many cafes and restaurants offer free WiFi with an advertisement in their windows. All you need to do is buy something and ask for the password. Apart from specific places, including soms airports and major stations, quite a few cities are offering free wifi, including Buenos Aires, Mendoza and Iguazu Falls. The country calling code to Argentina is 54. To make an international call from Argentina, dial 00 followed by the country code and the rest of the telephone number. All 0800 numbers are toll-free numbers, except if you call from a mobile phone. Emergency numbers are available for Police (101), Ambulance (107) and Fire (100). Emergency dispatcher for Buenos Aires (city), Santa Fe (city), Rosario (city), Salta (province), Corrientes (province), and Buenos Aires (province) 911. In a mobile phone 112 forwards to 911. You can get a prepaid Movistar / Claro / Personal SIM card for a few pesos / free at phone shops, all you pay is about 20 Pesos for your initial credits. Inserting the SIM card into your unlocked American or European mobile phone should work, although to register the SIM you have to enter your passport (or any 9 digit) number - you then have your personal Argentinean phone numbers. Calls cost around 1 Peso per minute. Receiving calls is usually free, except for international calls, and some cross network / inter-city calls - hence buying a SIM card purely to keep in touch with people overseas may not be worth it. Without a cellphone, there are similar cards with credits for international calls. You get them at so called locutorios, where you can also use the phone booths. You dial a free number to connect to the service, then your secret number for the credits, and then the international phone number you want to call. Using these cards, a one-hour call to Europe will cost about 10 Pesos. Don't call without such cards or even from your hotel - it will be way more expensive. Correos de Argentina is the national postal service of Argentina. There are also two private carriers operating nationwide (OCA and Andreani) and a number of regional ones though Correos de Argentina will be the one most likely to be used by travellers. Post offices are mostly open between 8:00am and 8:00pm Monday to Friday and 9:00am to 1:00pm on Saturday, though there are regional variantions with longer hours in central post offices in big cities and shorter ones in small towns. Services are pretty reliable but slow, mostly taking about two weeks to deliver a postcard or letter to the USA or Europe, but usually within a few days sending it domestically. There is also a more expensive express options. You can track a package online at the Correos de Argentino website. Parcels take at least 3-5 days domestically and weeks internationally. Otherwise try international companies like FedEx, TNT, DHL or UPS to send parcels. It is probably more reliable as well as faster. We have a comprehensive list of accommodation in Posadas searchable right here on Travellerspoint. You can use our map to quickly compare budget, mid-range or top of the range accommodation in Posadas and areas nearby. This is version 8. Last edited at 3:40 on Aug 2, 17 by sleepBot. 4 articles link to this page.